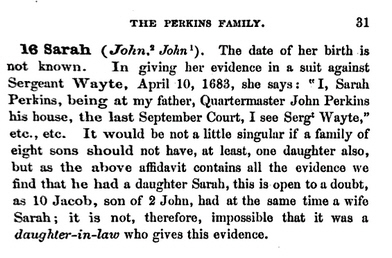 Quartermaster John PERKINS (1614 – 1686) was Alex’s 10th Grandfather; one of 2,048 in this generation of the Shaw line. Quartermaster John Perkins was born 1614 in at Hillmorton, Warwickshire, England. His parents were John PERKINS and Judith GATER. He came to America in the “Lyon” William Pierce master in 1630, with his parents and four siblings and landed at Boston, 6 Feb 1631. Their voyage was described as tempestuous. Roger Williams himself was a passenger in the ship. John married Elizabeth EVELETH about 1635 in Ipswich or Amesbury, Mass. He died 14 Dec 1686 in Ipswich, Mass. Alternatively, John died 29 Jan 1700 in Ipswich. Elizabeth Eveleth was born in 1616 in England. Many sources say her parents were Sylvester Eveleth and Susan Nubery (Newbury), however, I think that’s doubtful because Sylvester was only twelve years older than Elizabeth. A more likely explanation is that Elizabeth emigrated with her brother Sylvester. If that were the case, then her parents were John EVELEIGH (1580 – 1666) and Jane SILVESTER. (? – 1627) Alternatively, her maiden name was Newman. Elizabeth died 27 Sep 1684 in Ipswich, Massachusetts. A band of Indians sought to kill John while he was living “in a little hut on his father’s island”, but he was forewared of his danger by Robin, a friendly Indian. It would seem that he expected an attack, and had therefore called to his aid some of the sachems near Boston; for it so happened that Montowampate and Wonohaquaham were at Agawam when the Tarratines made an attack, but whether by concert or accident is not clear. To the number of 100 men, in three canoes, the Tarratines came out on this enterprise, on the 8 August following. They attacked Mascononomo and his guests in his wigwam in the night, killed seven men, wounded Mascononomo himself, and Montowampate, and Wonohaquaham , and several others who afterwards died. They took the wife of Montowampate captive, but it so happened that Abraham Shurd of Pemmaquid ransomed her, and sent her home, where she arrived on the 17 September the same autumn. ** From Mr. Cobbet’s account, it appears that they came against the English, who, but for an Indian, named Robin, would have been cut off, as the able men at this time, belonging to Ipswich, did not exceed 30; and most of these were from home on the day the attack was to have been made. Robin, having by some means found out their intentions, went to John Perkins, (living then in a little hut upon his father’s island on this side of Jeofry’s Neck) and told him that on such a day four Tarratines would come and invite the English to trade, “and draw them down the hill to the water side,” when 40 canoes full of armed Indians would be ready, under “the brow of the hill,” to fall upon them. It turned out as Robin had reported; but the Indians were frightened off by a false show of numbers, an old drum, and a few guns, without effecting their object. We hear no more of him until 1644, March 8, when, at a court held in Boston, ” Cutshamekin and Squaw-Sachem, Masconomo, Nashacowam and Wasamagin, two sachems near the great hill to the west, called Wachusett, came into the court, and, according to their former tender to the governor, desired to be received under our protection, and government, upon the same terms. that Pumham and Sacononoco were. So we causing them to understand the articles, and all the ten commandments of God, and they freely assenting to all,* they were solemnly received, and then presented the court with twentysix fathom of wampum, and the court gave each of them a coat of two yards of cloth, and their dinner; and to them and their men, every one of them, a cup of sac at their departure; so they took leave, and went away very joyful. John opened the first publishing house in Ipswich and also engaged early in the fisheries and by reason of his connection with the trainband, gained the title of Quartermaster Perkins by which he ever after was addressed. A trainband is a company of militia in England or America from the 16th century to the 18th century, not the band Train. 12 May 1675 – Quartermaster John Perkins, Sargent Belchar, Henry BENNETT I with several others petition the general court for liberty to lay out a new plantation which the court allow will be six miles square and not more than 10 miles long …. 16 Feb 1681/82 – Quartermaster John Perkins was one of the first signers of a petition to the King to resist the claims of Robert Mason to the title of lands around Gloucester, Cape Ann and places adjacent. 11 Nov 1682 – John Perkins of Ipswich, quartermaster and innholder in Ipswich sold to Mr. Jonathan Wade of Ipswich (and confirmed to Thomas Wade son of Jonathan Wade) one acre of land “of my farm of Chebacco next adjoining to the sawmill of said Wade” [ILR 5:88]. Quartermaster made no will at his decease, having given to each of his sons a good farm or houselot. He acquired a large property as numerous purchases and sales of property attest. John’s wife Lydia [__?__] was born about 1640 and appears to have died soon after their marriage. Abraham’s wife Hannah Beamsley was born 13 Dec 1643 Boston. Her parents were William BEAMSLEY and Anne [__?__] She first married Edward Bushnell b. 1643 in Boston, Suffolk, Mass. d. 16 Oct 1661 in Boston, Suffolk, Massachusetts. Hannah died 16 Oct 1732 Ipswich, Essex, Mass at the age of 91. 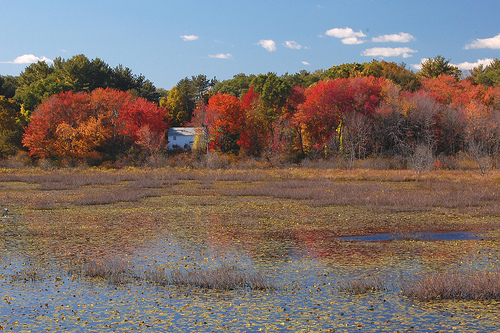 Abraham owned and cultivated Perkin’s Island formerly granted to his grandfather. Abraham employed his brother Luke to tend after the cattle on the island, etc. 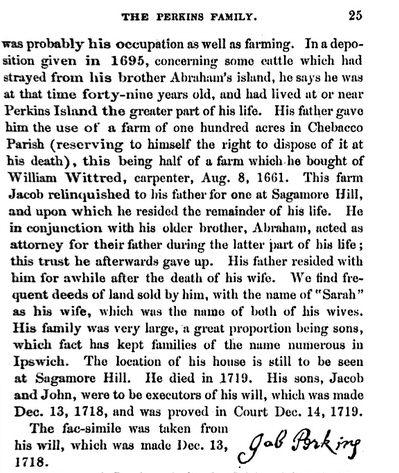 as Luke testified in a suit between Thomas Borman and Abraham Perkins that he had lived on the island for several years..
Abraham died after “being run over by a tumbril [A two-wheeled cart, especially a farmer’s cart that can be tilted to dump a load], broke many bones a Cross his breast”–Ipswich Vital Records. He was 82 years old. 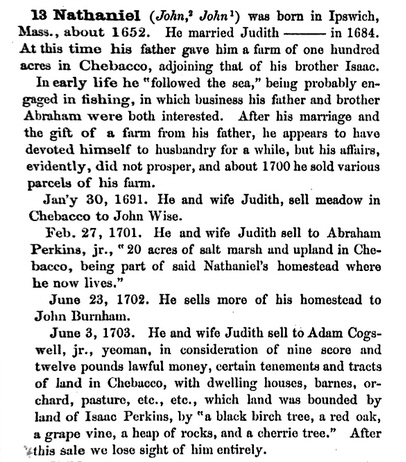 Jacob’s first wife Sarah Wainwright was born 1650 in Ipswich, Essex, Mass. Her parents were Francis Wainwright and Phillis Sewell. Sarah died 3 Feb 1688 in Ipswich, Essex, Mass. Jacob’s second wife Sarah Kinsman was born 19 Mar 1659 in Ipswich, Essex, Mass. Her parents were Robert Kinsman and Mary Boreman. Sarah died 26 Nov 1719 in Ipswich, Essex, Mass. Jacob had nine children with the first Sarah and seven children with the second for a total of 16 kids. Jacob lived most of his life on Perkins Island where he was a malster as well as a husbandsman. 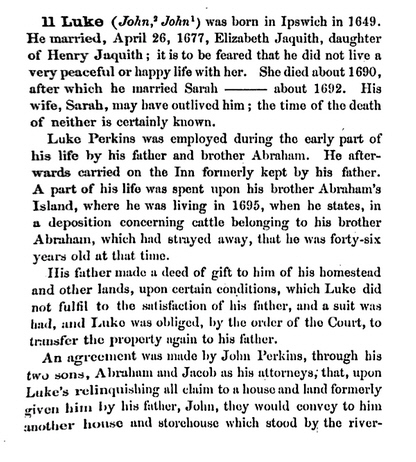 Luke’s first wife Elizabeth Jaques (Jaquith) was born 28 Oct 1669 in Newbury, Essex, Mass. Her parents were Henry Jaques and Anne Knight. Elizabeth died in 1690 or 1743 in Newbury, Essex, Mass. 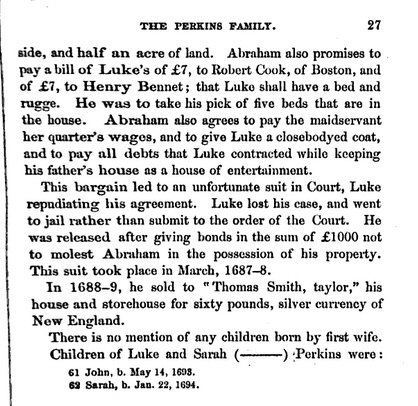 Luke’s second wife Sarah [__?__] was born about 1650. Isaac’s wife Hannah Knight was born 1645 in Ipswich, Essex, Mass. Her parents were Alexander Knight and Anne Tutty. She first married 9 Nov 1664 to Robert Whitman. Hannah died 1725 in Ipswich, Essex, Mass. Nathaniel and Isaac signed the petition in support of John Proctor oldest son of our ancestor John PROCTOR and his wife Elizabeth Proctor at the Salem Witch trials. Nathaniel’s wife Judith [__?__] was born about 1655. Judith died 3 Jun 1703. Thomas seems to have been an invalid and incapable of supporting himself. Quartermaster John made special arrangements for his maintenance and clothing. This entry was posted in 12th Generation, Immigrant - England, Line - Shaw, Place Names, Tavern Keeper, Veteran, Witch Trials and tagged Perkins Island, Signature, The Lyon 1630. Bookmark the permalink.